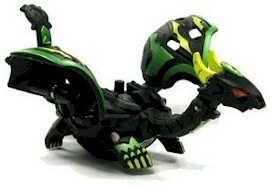 Dharak is a four-legged dragon Bakugan. He is the Guardian Bakugan of Emperor Barodius, the main villain in Bakugan: Gundalian Invaders. Its Pyrus version comes in three variations, with 770 Gs in Crimson and Pearl, one that comes with the BakuClip, and one that comes in a Brawler Game Pack. Its Subterra version comes in two variations, with 620 Gs in BakuTriad, and 720 Gs in Game Pack. Its Haos version comes in four variations, with 640 Gs in BakuTriad, 660 Gs with a Bakuclip, 690 Gs in the Target-exclusive "Evil Twin" pack, and 750 Gs in BakuGranite. Its Darkus version comes in five variations, with 610 Gs in BakuTriad, 670 Gs in the Target-exclusive "Evil Twin" pack, 750 Gs in Combat set/Game Pack, 800 Gs in Brawler Game Pack, and 790 Gs in BakuBoost. Its Aquos version comes with 720 Gs in Bakutriad and Bakuboost. It is also available with the Gundalian Invaders BakuClip. Its Ventus version comes in two variations, with 700 Gs in BakuBoost and 660 in Brawlers Game Pack. A BakuBlue is 870 Gs for Aquos only at Walmart. Purchase your Dharak from Amazon now!